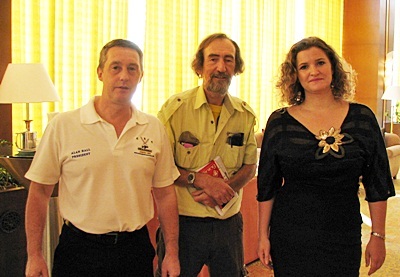 From left, Alan Hall President of the Chiang Mai Expats Club with Tom Fawthrop, documentarian and speaker at the Saturday, February 13 Chiang Mai Expats Club meeting together with singer Ana Gracey at the Chiang Mai Expats Club meeting at the Shangri La Hotel. 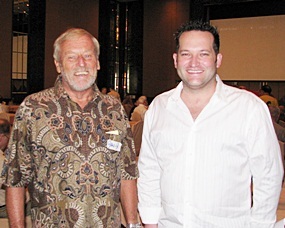 David Watts, left, of Viang Ping Massage & Spa joins Golden Whitehead, Shangri La Hotel’s Food & Beverage Director, at the Chiang Mai Expats meeting at the Shangri La Hotel. Magrin Phromyothi, 5th from left, General Manager of Kantary Hills Hotel, Chiang Mai introduced their new Public Relations Manager Kulaseth Hovongratana, 4th from left, at a recent dinner party at the hotel. 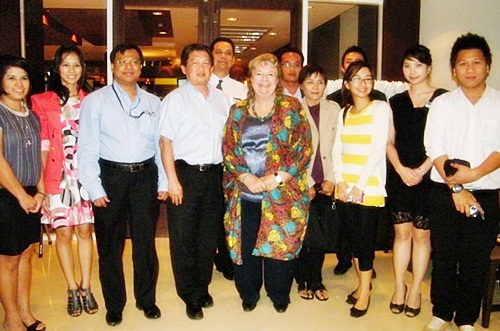 With them, are Atiroj Chotpornsawat, far right, Assistant Public Relations Manager, Tanabhorn Wongchindarak, 2nd right, and guests. 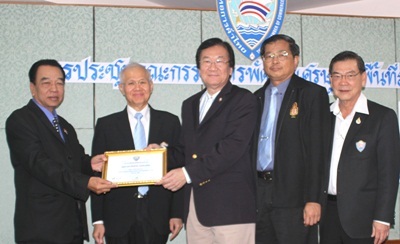 Somkiart Anuraj, Thai Chamber of Commerce Vice President, presented a certificate of commendation to Supoj Klinpraneet, far left, Mae Hong Son Chamber of Commerce President, for increasing the Chamber of Commerce enrollment from 175 members to 400 in 8 months . The presentation was held at the committee meeting of the 17 Northern Provinces economic development plan at the Gateway Hotel in Phayao Province.